Nadine joined the tribal team as the Solar Installation Supervisor in early 2018 after working at the GRID Mid-Atlantic office for 1.5 years. Bringing clean energy technology to underserved communities inspires her every day. She has a masters degree in renewable energy engineering and speaks English, Spanish and German. 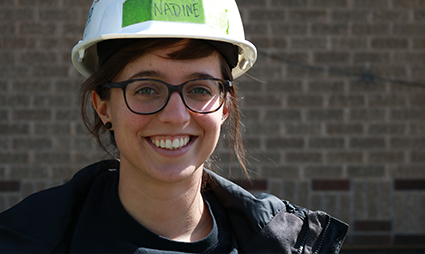 Her passion for environmental justice, clean energy and job training has not only lead her to volunteer with GRID but also for a renewable energy non-profit in Guatemala as well as Habitat for Humanity. In her spare time she enjoys being outdoors and going on bicycle trips.